Online businesses are highly competitive, and if you are seriously considering developing a successful business you have to learn how to reach the top and stay there. These beautiful, modern, and intuitive WordPress theme are perfect for model agencies and will breathe new life into your company and website. No matter your vision, style, or the size of your business, these 20+ model agency WordPress themes will allow you craft and develop a one of a kind professional website to showcase your company and features. Enjoy! 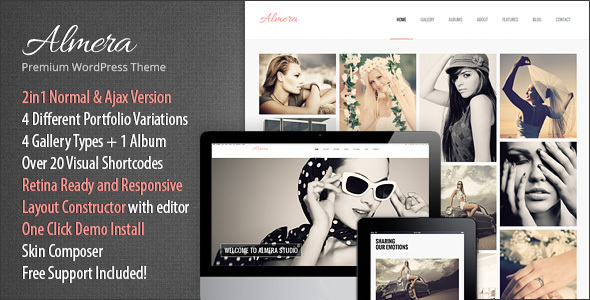 Almera is a creative, attractive, easy to use, flexible, reliable, premium, responsive model agency WordPress theme. This theme gives you complete creative freedom to personalize your website. With just a few clicks you can craft various unique layouts with the theme’s Layout Constructor. The theme’s customizing panel will allow you to take control of the design elements and customize them. If you want to learn more about Almera, just click on the demo button. 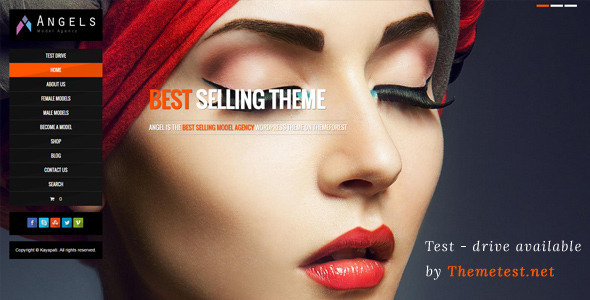 Angel is a beautiful and easy to use WordPress theme perfect for those looking to creative a model agency website fast. Angel has a bunch of impressive theme features and tools ideal for adding value to your website and improving it. You can also take your time and explore this theme’s features some of which are fullscreen background, custom sidebar generator, page builder, unlimited portfolio grid styles, Google fonts, WPML compatible, and much more. This theme’s code is SEO optimized so your rankings will also improve thanks to Angel. Coming at number one Models Agency is without question one of the best model agency WordPress themes available. It gives you the chance to create an eye-catching, modern, and professional website for your model agency or fashion portfolio website. Take matters into your own hands and create something beautiful and unique with Models Agency. 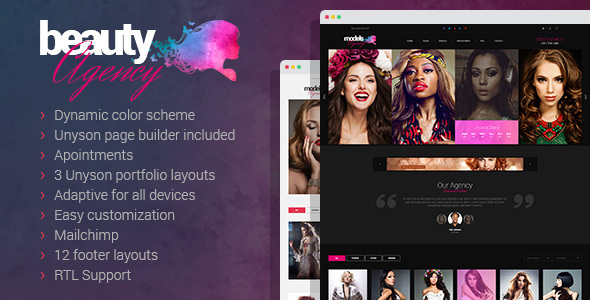 Models Agency does exactly what a theme for this niche is supposed to do and its features are dynamic color schemes, integrated unison page builder, appointments form, 3 portfolio styles, mailchimp integration, 12 footer styles, and RTL support. Check out the live demo to explore Models Agency more. Faxhion is a stylish, beautiful, colorful perfect for a model agency business. This theme is highly intuitive, customizable, and fully responsive. Faxhion comes with 9 ready to use homepage demos, 4 unique portfolio styles, 3 header styles, 2 premium plugins, smooth scrolling effect, 3 blog styles, parallax effect, supports 6 post types, and beautiful galleries. Faxhion will impress your audience and keep it engaged. This beautiful and unique WordPress theme will surely impress you. Modellic is designed to fit perfectly for model agencies, portfolio websites, and photo studios. It has a classic layout, which makes it adaptable to almost any type of website. Modellic also is fully responsive and adjusts to all popular browsers, mobile devices, and screen sizes. This theme includes a couple of already built demos, WooCommerce integration, Facet filters, Visual Composer, Revolution slider, and uber Google maps. 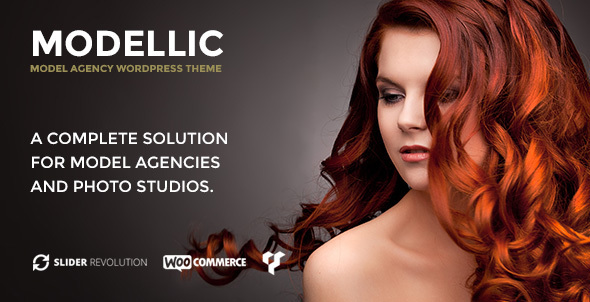 It deserves its place in the top 3 best model agency WordPress themes. Make your visitors fall in love with your agency! 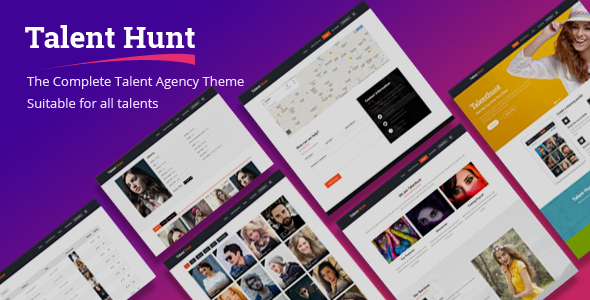 Talent Hunt is a modern, appealing, robust, flexible, highly customizable, premium model agency WordPress theme. It is ideal for model agencies, castings, fashion blogs, photography websites, and more. Talent Hunt is responsive and will adapt perfectly to all screen sizes and mobile devices. Some key features of this theme are the niche related custom fields, beautiful sliders, talent list addon, composite cards, included page builder, and model enquiry form. Explore Talent Hunt in greater details by click on those two buttons below! Most websites are not unique, impressive, or engaging. They just are. In order to build a successful website for your business and develop your online presence, you need a beautiful, attractive, and modern-looking theme. Talents comes with all the necessary tools to help you reach that level of success. It features a one click demo installer, custom fields for talents, an integrated popular page builder, talents shortlist, advanced search options, a set card, user registration, and an intuitive live customizer. If you are ready to make your debut in the big league, Talents is the theme for you! This next premium WordPress theme has a clean, attractive, and simple design perfect for promoting your model agency. Lavan will help you build an online presence and get ahead of your competition. Lavan offers its users over 10 homepage demos, SiteOrigin page builder, custom widgets, an easy to use theme customizer, Kaya slider, portfolio page templates, video support, custom sidebars, unlimited portfolios, header slider, and much more. 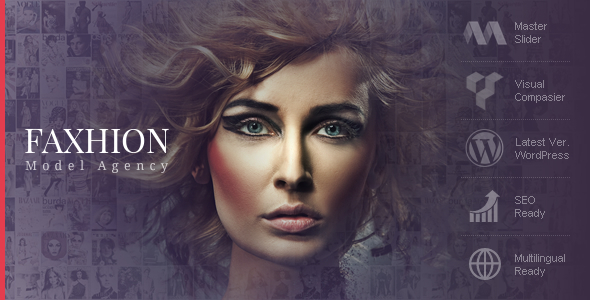 Check out Lavan and see its full potential as one of the best model agency WordPress themes! Want to present your business to the world in a stylish, modern, and professional way? Then Art Portfolio is the ideal model agency WordPress theme for you. This theme comes with a plethora of features and tools you can use to craft the website of your dreams. Art Portfolio features various one page and multipage demos, Visual Composer, unique gallery layout, WooCommerce support, 4 gallery styles, 4 layouts for work view, 2 blog styles, and an easy to use theme customizer. Give your audience a reason to come back with Art Portfolio! Turn your business into a thriving one with this unique, clean, modern, professional, and highly customizable WordPress theme. Brian will offer you the tools required to be different and have a thriving business. The theme comes with 5 header styles, unlimited colors and fonts, 10 page templates, custom sidebars, custom footers, a beautiful portfolio page, several blog layouts, and the option of importing the demo content. Use Brian to design something that appeals to your target audience! Top Model is a model agency WordPress theme that will make sure you stay ahead of the competition. It has a professional, clean, gorgeous, and unique design that will stand out from the crowd and make long lasting impressions on your audience. 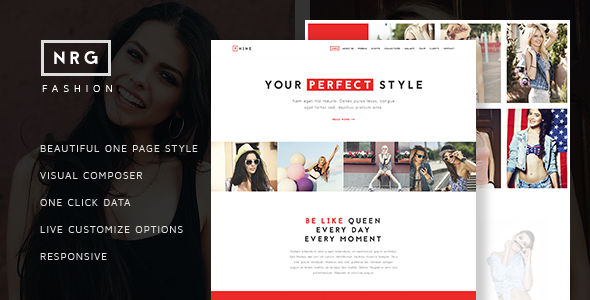 With Top Model you can choose between several homepage layouts, portfolio styles, blog layouts, schedule events, sell products, use shortcodes, customize the headers, and many other options. This theme will enhance your website no matter what your vision is and turn it into something unique. 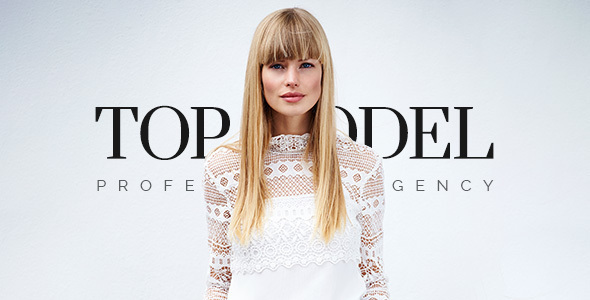 Top Model is among the most well designed model agency WordPress themes of the year! 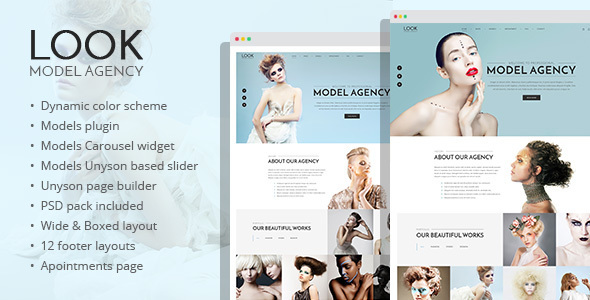 Look is an aesthetically pleasing, gorgeous, up to date, versatile, daring model agency WordPress theme. This theme is an attention grabber and will encourage your visitors to explore it further. Look works perfectly as a platform for developing this type of websites because of its incredible and easy to use features. It includes a recent posts carousel, PSD files, free fonts and icons, a responsive design, 12 footer styles, beautiful custom widgets, unyson support, mailchimp support, and a valid and optimized code. Look will meet your business requirements and exceed them. Try Look today! Check out this unique, attractive, robust, reliable, stunning, and modern WordPress theme. 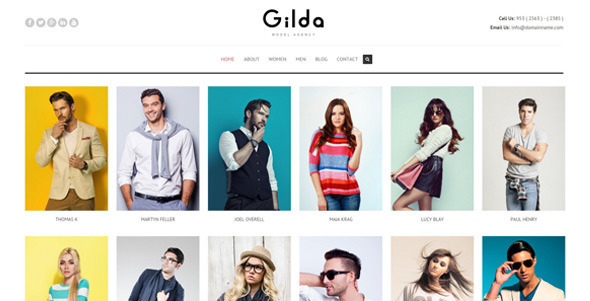 No matter your design choices, Gilda will make your website look amazing. This theme comes packed with useful theme features and is highly customizable. It includes custom fields for talents, advanced search form, talent shortlist, compcard, option to import the demo content, integrated page builder, and a powerful live customizer. Get inspired with Gilda! If you are looking for a one of a kind, modern, and user friendly premium theme for your model agency, then look no further than Julia. It will make your website look professional, and enhance it. Julia comes with a responsive design, talent custom fields, talent shortlist, live customizer, model details, an easy to use page builder, talent submission form, and other features. Present your business in a professional and fashionable way so that you can attract new prospects. Tell the world more about your business with Julia. Give your audience a reason to choose your business by showcasing your services, portfolio, and models. NRG fashion will help you get started. This premium WordPress theme comes with essential features and tools ideal for creating a successful model agency website. You can craft unique pages with Visual Composer, add easy one page sections, play with the live customizer, brand your website, select Google fonts, or import real data. 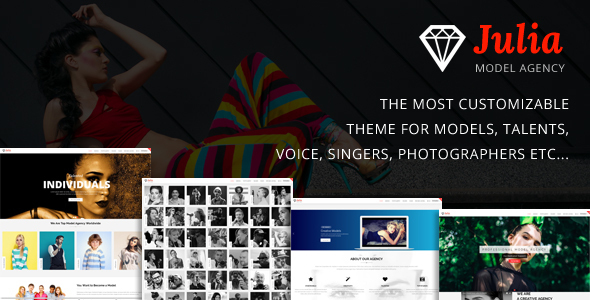 All these features make it one of the highly successful model agency WordPress themes! Let’s make your website beautiful and stylish with NRG fashion! Take your business to another level with this eye-catching, visually stunning, modern, elegant, and responsive WordPress theme for model agencies. Scent will help your business take off and develop an online presence. This theme is designed with love and care and includes some amazing features such as models gallery, fullscreen banner, about us section, staff carousel, blog layouts, price tables, testimonials, contact form, customizable colors, special content pages, and Google fonts. With Scent your business will always be in style and fresh. 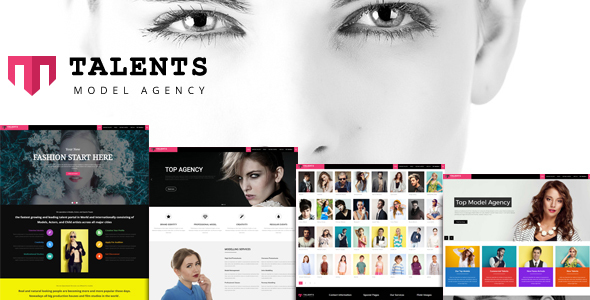 Try today one of the most powerful model agency WordPress themes on the market! Dondo is a clean, appealing, uncluttered, professional, and full of potential, premium WordPress theme. Dondo is the ideal choice for you if you are searching for an intuitive platform to develop your website. Make any changes you deem fit for vision through the theme’s admin panel. Some of the theme’s key features are WooCommerce integration, Revolution slider, Essential Grid, Visual Composer, option to import the demo content, support WPML, comes with a child theme included, awesome shortcodes, and more than 500 Google fonts. Spice up your website with Dondo! 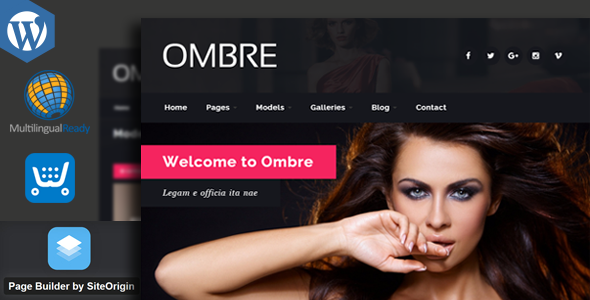 Ombre is a fully responsive, appealing, gorgeous, modern, and stylish WordPress intended for fashion and model agencies, as well as fashion blogs. It has a simple and beautiful layout that will adapt to any type of content. Build a unique website with Ombre in minutes. The theme’s features include a potent theme settings panel, SiteOrigin page builder, models portfolio, responsive galleries, WPML and RTL support, custom widgets, Google maps, shortcode generator, and page loading animations. Ombre comes with a live preview you can play with and test out the theme. Designed and developed by the same authors as Talent Hunt, this premium responsive theme raises the bar. Strengthen your business and online presence with this lovely, user-friendly, and modern theme. 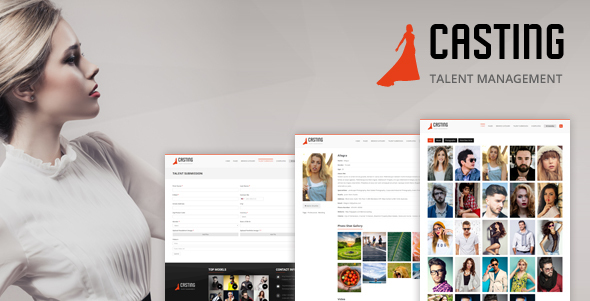 Casting is a talent management and model agency WordPress theme that can serve as an ideal platform for showcasing portfolios and services in this niche. It contains features like free demo configuration, custom meta fields, advanced search widgets, smart slider, a responsive design, and much more. I recommend checking it out today! 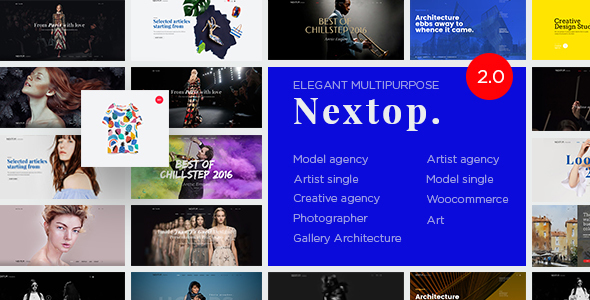 Completing this list of model agency WordPress themes with Nextop! Just take a look at this stunning, up to date, intuitive, enhanced, and responsive theme. Nextop comes with a clean and smooth layout, responsive and cross-browser compatible. Nextop was designed to capture the attention of your online audience and inspire them. Nextop features a one click installation, pre-built creative demos, Visual Composer, Master slider, SEO optimized code, WooCommerce integration, a child theme included, and shortcode generator. Feel free to play around with this theme’s options to create something unique and matches your company. Selecting the perfect WordPress theme for your business is always a hard decision to make, but hopefully this list with the best model agency WordPress themes will help you narrow it down. If you have questions, let us know!